The massive amounts of garbage spewed in the US media about Hugo Chavez since the announcement of his death reveals yet again the desperate machinations of a corporate propaganda machine run amok. Even Rachel Maddow’s discussion with Eugene Robinson on MSNBC last night stuck to the standard media script of glossing over or ignoring his efforts to uplift the lives of millions of poor people in this hemisphere and focused instead on his personality and clashes with the US. To counteract the lies and bigotry of the right wing noise machine, and the anemic and cowardly coverage provided by much of the so-called “liberal” media—for which William Neuman’s article in today’s NYT serves as a sterling example, and no, I will not link to it—I offer the following fact-based views about the life and legacy of Hugo Chavez. Carles Muntaner, Joan Benach, Maria Paez Victor list Chavez’s many achievements over at Counterpunch. Also check out George Ciccariello-Maher’s insightful piece at Counterpunch on a Post-Chavez Venezuela. Greg Grandin in the Nation gives us this balanced portrait of the man and his accomplishments. 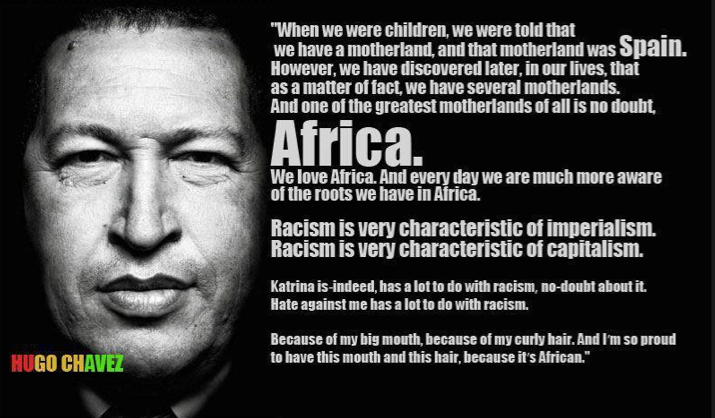 Like all human beings, Chavez had his flaws and failures. But he went to his grave speaking truth to power and leading a revolution that is still unfolding. Rest in Peace Comandante. This entry was posted in South America and tagged Bolivarianism, Caribbean, Counterpunch, greg grandin, Hugo Chavez, Latin America, The Nation, Venezuela by Ourstorian. Bookmark the permalink.